At Chicagoland Sports Cards, we package every order with care to insure your items arrive quickly and safely. Please read our shipping details below. Call or email us if you have any questions. SAME DAY shipping for all in-stock orders placed and paid for before 4:30pm CST (except for weekends and holidays recognized by UPS). FREE Shipping to the Continental US (lower 48 states) for all orders over $199!! All orders under $199 proper shipping charges will be added plus a $4.50 Signature Delivery Confirmation fee will apply. Pre-sell items will ship the same day we receive them (almost always within 1 business day of the product's release date). 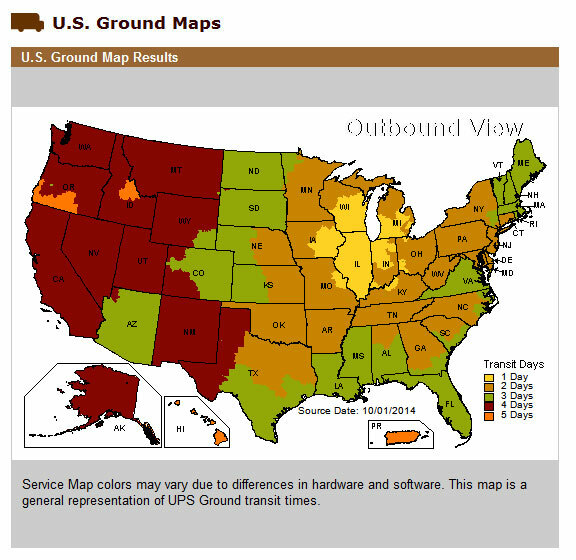 Please see map below to see approximate UPS Ground transit time in business days from our Buffalo Grove, Illinois warehouse location to your home. Note: UPS does not ship on Saturday or Sunday, hence the transit time is in Business Days.